Hobby Shops in Strange Places XXIV – AKIHABARA! Goodness gracious! There are so MANY hobby shops in Akihabara town of Tokyo that we had to go there every single day. The very first evening we arrived in Tokyo, we ventured forth into the frenzy that is Akihabara. 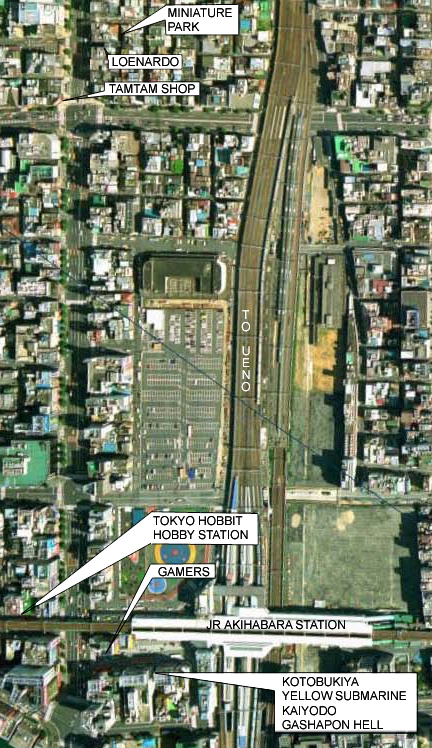 All o f the stores mentioned in this report are within walking distance of the Akihabara JR Station. The Akihabara JR station has a cruciform layout with the Yamanote line trains from Ueno/Tokyo Stations being on the North South axis and the Sobu line on the east west axis. But let’s describe the scale shops by store. 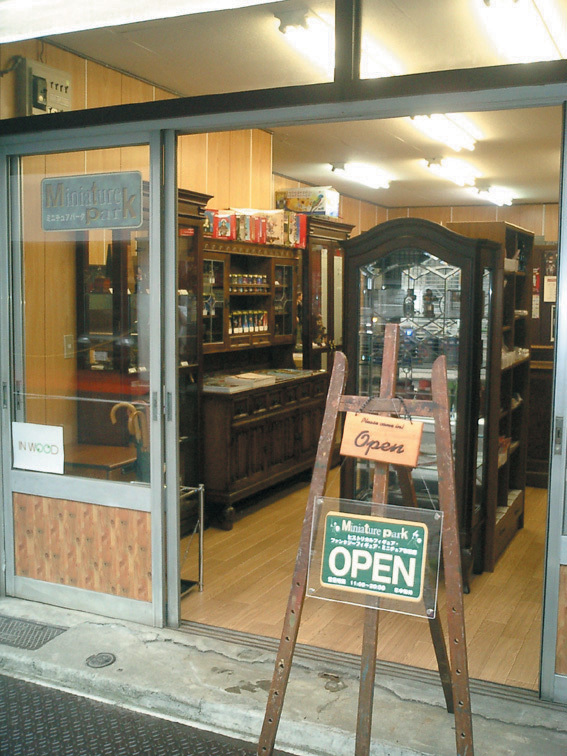 The non-scale shops will be described next month. 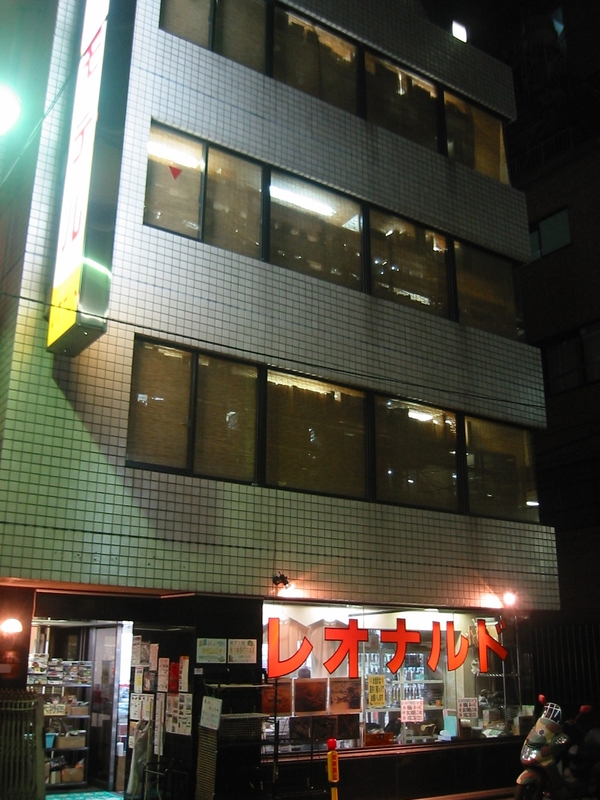 Yellow submarine is situated on the second and seventh floors of an 8 story building, The Radio Kaikan Building, across the south-east entrance to the Akihabara JR Station. This particular building held five hobby shops of interest to us; Yellow Submarine, Volks Shop, Kotobukiya, Hobby Lobby Tokyo and Kaiyodo. Let me discuss the Yellow Submarines’ Scale Shop on the seventh floor. This place is absolutely amazing. I had been looking all over Tokyo for a 1/700 scale Kombrig kit of the Russian Battleship Navarin. This place had it in stock. If you are looking for figures, this place rivals Miniature Park. Miniature Park is a tiny little store that specializes in figures, more on that later, but it too is in Akihabara. Wooden bases, decals and all the main stream paints are available and in stock. The have a very nice selection of aircraft and armor kits. A lot of the stuff I see advertised coming out of Eastern Europe is here along with al the neat and unheard of stuff from Japan. I found a really cool looking X-38 from TAC (Tokiwa Aircraft Company) in 1/144th scale, Anigrand kits out of Hong Kong, F&E kits out of the Czech Republic and more. If I were allowed only one scale shop to visit in Tokyo, this one would be the place. The old staple of Akihabara is Leonardo. The have moved from their previous location East of Akihabara JR station to a multi-storied place North of the station along Chuo Dori. Leonardo maintains their position as the great depository of out of production kits at out of production prices. While the majority of their kits were about 10% below MSRP (you know what the price is by the number on the box) the more collectible kits reflected their rarity in the price. I really wish I had bought that out of production two-seater Jaguar kit. Oh well. Each level of the store had different items. Leonardo had one floor for ships, another for aircraft, another for cars and trains and yet another for figures and Sci-fi. Tools, accessories and such are all on the first floor along with all the latest releases. The beautiful young ladies we met on the last trip in 2002 were still there, but no apron this time, just a well fitting and pleasantly snug T-shirt. If you like buying Hobby Shop T-shirts, Leonardo has one that will fit enormous Gaijin like me. 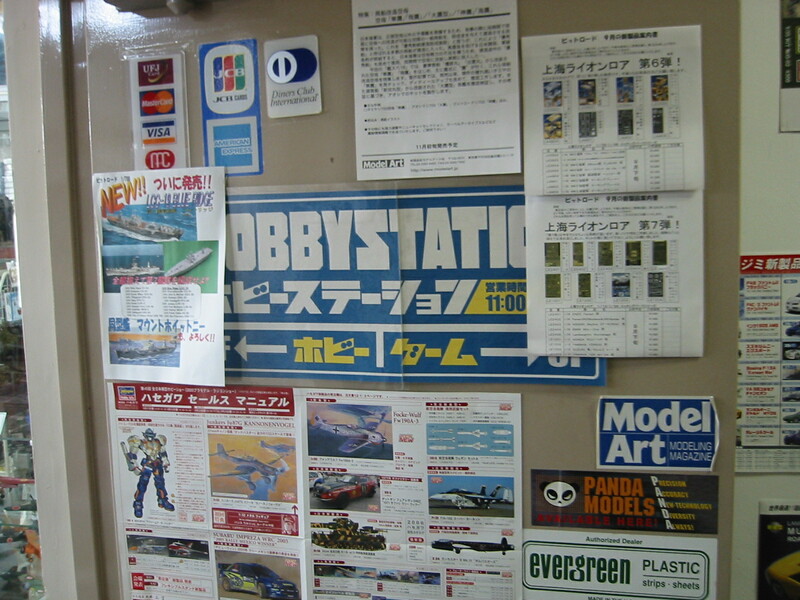 Hobby Station was the first "scale" hobby shop I visited on this trip. I was in heaven. They had tons of model kits from all over the world. Plastic as well as some resin kits I don’t see in stores in Hawaii. They had a small wall of decals (the way decals should be displayed, not in a floppy book or binder) and another wall with bunches and bunches of Photo Etched parts, cast white metal parts and resin parts. Their 1/700 scale ship accessory section was also beautiful to behold. Gun barrels from Joe’s World, PE parts in smart blue boxes from Gold Medal Models, Toms’ Modelworks, Pit Road, Lion Roar and Eduard; and white metal tanks, planes and other miscellaneous accessories from Pit Road and White Ensign Models. I ended the evening’s visit by picking up a 1/700 scale Yamato Battleship, a 1/700 scale Tama light Cruiser, lots of PE and Barrel parts. Needless to say, I visited this store a few more time over the course of the trip. The TamTam Shop is on the major intersection just before you hit Leonardo and Miniature Park. If you’re out here for Leonardo, you might as well stop by TamTam Shop as well. You enter an elevator that faces the street, when the doors open again, you are staring right at a giant train set diorama. It was too cool. This TamTam shop seems to specialize in trains. Hoo Boy, it’s a good thing I’m not into trains otherwise I’d be a much poorer person. I would have dumped a load of $$ in this place. It seems Japan favors N scale over HO scale. This is fine by as I do too. Lance went hog wild over the building kits. They had dozens and dozens of N scale kits and accessories. What really impressed me about this place was their wall of trains. From floor to eye level, they had a shelf upon staggered shelf of train tracks filled with trains. You could find the N scale Yamanote line cars, Shinkansen Cars, Tomix, Kato, Modemo, Hasegawa, Platz and more. Boy am I glad I don’t do N scale trains. But this place makes me want to. I think it is safe to say that Miniature Park is Figure modeling headquarters for Tokyo. I really wish my camera was working the night I visited this shop. For Figure modelers, this place is the cat’s meow and my wallets OW! This store is within spitting distance to Leonardo’s new location 500 meters north of the JR Akihabara Station along Chuo Dori. Miniature Park is one block east of Chuo Dori and about 10 meters north of Leonardo (see Map).